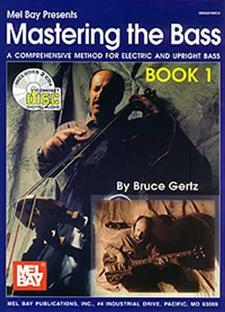 “Mastering the Bass is a thorough method for both electric and upright bass designed to guide bassists to mastery. It begins with building strong time and rhythmic skills, a firm foundation upon which all bass playing must be rooted. Following this, students learn a wide range of grooves and practice reading all styles of music: Blues, Rock, Funk, Reggae, Fusion (including odd meters), Jazz, Latin, Baroque, Classical and more. Ear training incorporated into the method improves the students’ listening skills, teaching students to hear chord progressions, melodies and rhythms. Theory lessons help students understand how the bass functions in music. Students also study improvisation of both bass parts and solos on chord changes, articulation (finger and bowing technique), performance goals, visualization, and more. 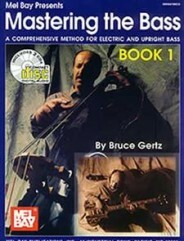 Each volume moves logically to the next level Even seasoned players can fill holes in their technique by going through the method from Book I and moving on to greater technique as well as a deeper understanding in later volumes.